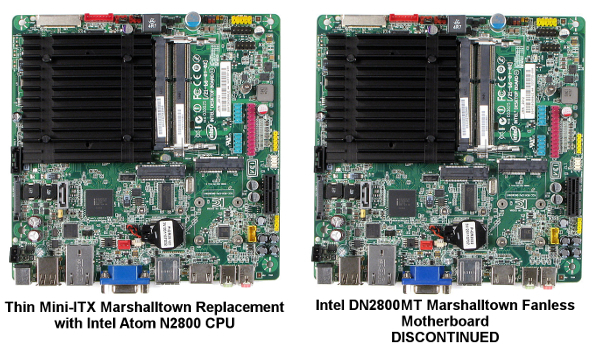 Intel’s DN2800MT Marshalltown: What you need to know. In the consumer space, we’ve learned to live with instant obsolescence and flash-in-the-pan product life cycles. In the enterprise, embedded, and industrial computing markets, however, our customers expect stability, and so do we. After all, product line redevelopment and re-certification are expensive and time-consuming on both sides of the equation. At the beginning of the year, Intel made it clear that they intended to phase out Mini-ITX in favor of the new Next Unit of Computing form factor. Shortages of the DN2800MT “Marshalltown” followed. This board is one of our best sellers and the centerpiece of many of our systems. Thanks to our carefully cultivated vendor relationships, we’ve been able to stay ahead of these shifts. In fact, we’ve been working directly with Intel to ensure that our customers can take advantage of the Marshalltown’s unique features and compact Thin Mini-ITX form factor for years to come. But wait, that’s not all! Earlier this year we launched our partnership with ASRock’s IPC division, and they’ve released their own Marshalltown equivalent, DN2800MTA. While the rear I/O on the ASRock version remains the same, there have been a few changes to the on-board I/O connectors, including the loss of Embedded DisplayPort. However, the DN2800MTA comes with an even longer industrial life cycle that will carry it through 2017. Still have questions? Great, we have the answers. Let us know.